It's halloween time. I"m not into the scary stuff, but the orange color sure looks nice all around. And wouldn't it be great to have a gift card to go shopping to your hearts delight? Well, come and enter the $200 Dave & Buster’s GC + Monsterland Book - #MichaelPhillipCashBooks #Monsterland for your chance to win!! What a cool prize huh? Michael Phillip Cash never disappoints! Have you read any of Michael's books as yet? Tell me one of your faves if you are one of his fans. 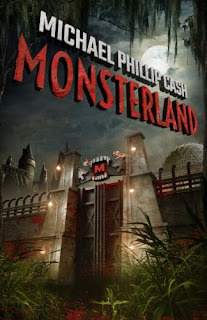 Michael Phillip Cash's new book explores this theme park in full with his new book, "Monsterland." 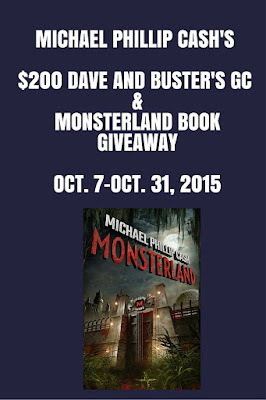 Disclosure: YOUR BLOG HERE was asked to promote this giveaway on behalf of Michael Phillip Cash and Away We Go Media and was not compensated in any way. If I created a monster, it would look like Niklaus Mikaelson. He is hot! Sounds like a great book for Halloween. I'm not ready for that holiday yet, I haven't gotten my kids' costumes yet. Hmm, I would probably create a nice monster, lol. It might come out like Herman Munster! If I created a monster it would be a cross between a bear and a wolf. I would create a little one - one hard to find! It would be purple and very human like and cute!